Home » Posts Tagged "20s hats"
At last! A bobbed haircut has arrived at Downtown Abbey, shown on on PBS-TV last night. 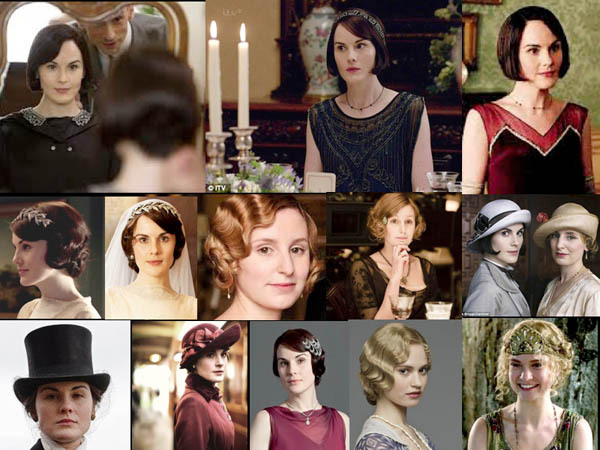 Lady Mary (Michelle Dockery) went to her hairdresser, top left, and did it. Love all the wonderful waves but it is time for the ’20s to come roaring in and hair fashion to make its statement, along with all the beautiful hair jewelry and hats, some of which are shown here from the ITV hit series which started in the Edwardian era with such amazing meticulously researched and inspirational fashions. So, who is next? Lady Edith. Will she bob? Or, more likely, it will be Lady Rose. Or will someone downstairs take the step? No spoilers please from the UK, who have seen the series. We in America are still on Series 5.